Any amount of lead exposure is harmful to human health. People using firearms, handling ammunition or visiting shooting ranges are at risk of inhaling or swallowing lead, or to a lesser extent, absorbing lead through the skin. How are we exposed to lead? Lead is present in most types of ammunition. It can be found in the projectile and the primer (the explosive that ignites gunpowder) of ammunition. Lead in the primer and the outer surface of the projectile is vaporized and released into the air after a firearm is discharged. Lead dust and fragments are also released when the projectile impacts solid surfaces. For these reasons, surfaces in shooting ranges may be contaminated with fine lead dust. This dust can also be breathed in and swallowed. Lead dust may be suspended in the air or stick to people’s hands, hair, face, clothing and footwear. This dust may be transported on your body, clothing and equipment from a shooting range into a car and into your home. How can lead affect health? Good hygiene practices can reduce the risk of lead exposure. Do not eat, drink or smoke while shooting as this makes swallowing of lead more likely. Wash your hands, neck and face with soapy cold water before taking breaks and when you have finished shooting for the day. Shower after shooting. If showers are not available in your shooting range it is recommended you shower as soon as you return home. Change your clothes and shoes before leaving the shooting range if possible. • Using clothing and shoes dedicated to shooting activities or wearing disposable coveralls. Clothes used for shooting should always be washed separately from general laundry. • Wearing gloves when shooting, handling ammunition, casings or when cleaning handguns. Remove Harmful Lead & Heavy Metals. Get rid of harmful lead, and other heavy metal residue on your skin during, and after, shooting and reloading. D-Lead removes lead and other heavy metals from your skin and other surfaces.D-Wipe Towels are convenient one-use wipes that are portable and can be used on the bench or at the range. 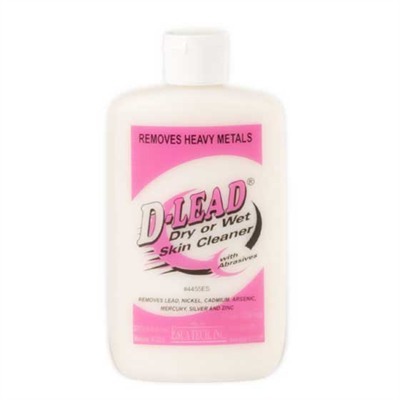 D-Lead Dry or Wet Skin Cleaner cleans and conditions the skin with or without water. How can I reduce lead exposure? In the past, lead-based ammunition has been used because of its high density, lower cost and longer shelf life. However, alternatives to lead ammunition are available. • If possible, use lead-free ammunition - ammunition that replaces lead-based primers with safer alternatives and/or ammunition that uses lead-free or jacketed projectiles that have a lead core covered with a copper or nylon coating. • If available, use shooting ranges that encourage patrons to use lead-free ammunition. Poor ventilation of indoor shooting ranges may result in unnecessary exposure to lead vapor and dust (good ventilation removes some lead vapor). If the range regularly appears ‘smoky’ or you have a metallic taste in your mouth it is likely that ventilation is poor. Try to use a shooting range with adequate ventilation or use an outdoor range. Lead is ‘sticky’ and can be transported from a shooting range on your body, clothes and equipment, into a car and your home. This may expose your family and children. Always wash or shower and change clothes before leaving a shooting range. Think twice before taking children to a shooting range and take the steps described here to ensure your body and clothing are free of lead dust before embracing children or handling toys and personal effects. If you regularly visit shooting ranges let your doctor know and get your blood lead level tested. • Is it well ventilated? • Are the range and all communal areas clean and free of visible dust? • Does it promote the use of lead-free ammunition and require good hygiene practices? • Does it offer change rooms, lockers and showers?